SeekBar is the extension of ProgressBar in android. 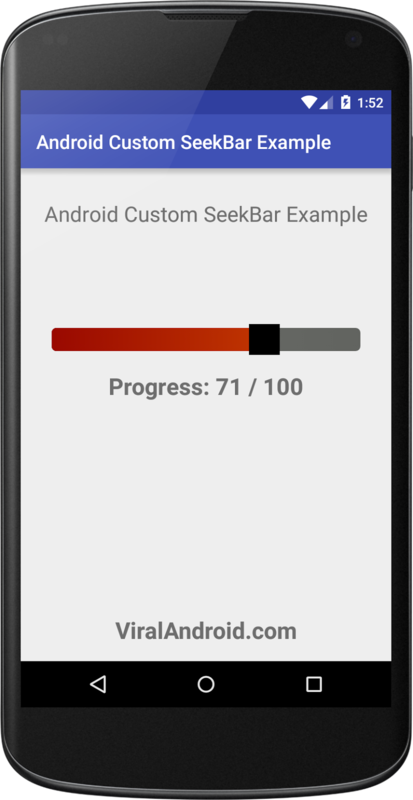 In this tutorial, I am going to show how to customize android SeekBar. There are lots of ways to customize SeekBar and here I have mentioned idea to customize SeekBar with the help of XML. To control the event handling method for SeekBar, you have to use seekBar.setOnSeekBarChangeListener(………….). Let’s start by creating seekbar_progressbar.xml file in your res/drawable directory and add this content. And download the below seekbar-thumb.png image and paste it in your project drawable folder. Following is the xml layout file where I have added a and added some new attributes in SeekBar. Now, run your application, which looks like output given below.